My own 2013 experiment using earthworms for kitchen waste composting turned out to be such a disaster that I decided to keep it limited only to garden waste. But when Bangalore-based Anil Kumar, MD, Akruthi Enviro Solutions Private Limited, told me that their organic waste digester uses earthworms to process even 500+ kgs of kitchen waste mixed with garden waste per day, I thought I was opening a new chapter in vermi-composting. So, to be thorough, I visited two locations to understand the mechanism. In the first location, the apartment situated in Yelahanka had not started composting. The idle setup allowed me to study the whole infrastructure thoroughly. In the second location, an apartment in Whitefield, a badly managed unit laid bare how things could go wrong if there is no monitoring. Ultimately, a system works only when both ends of the business do their job: A well-designed, efficient machinery and a well-run waste management system. Hence, in the absence of the latter, I can only write about the process as explained by the vendor. It’s a neatly designed, steel-bodied enclosure which comes fitted with a roof, a staircase and a heavy-duty shredder. The main module of the digester has conical-shaped suspended chambers made of steel mesh fixed well above the ground level. Anil says that the module of the digester is made of high-quality SS304 steel to avoid rusting. The mesh ensures ample air circulation from all the sides. This is where composting happens. Each chamber can hold 50kgs of pulverised waste per day. 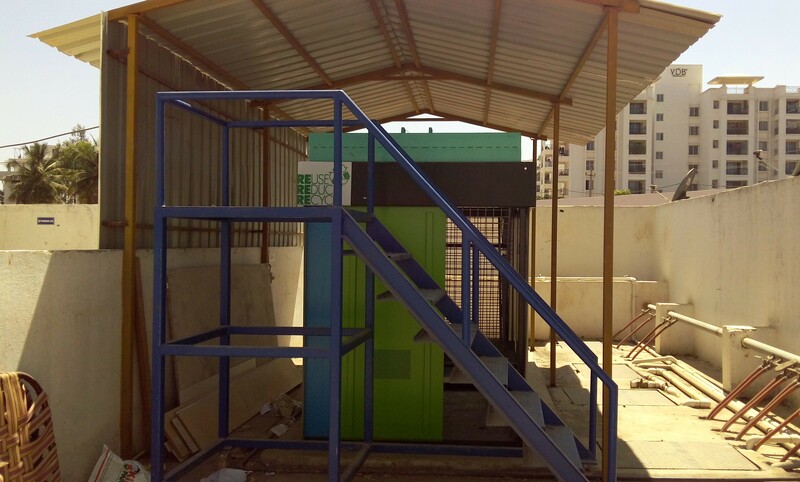 The smallest capacity has two such chambers to take in a minimum of 100 kgs per day. These chambers lay enclosed in a shell painted blue and green which is made of powder-coated mild steel. It has sliding doors on two sides. On the top, you get two hatches which need to be opened to put the waste in the chambers. You can reach these hatches by climbing up a staircase. There is a sprinkler which is needed to moisten the substrate and maintain appropriate moisture for the worms to thrive. The vendor also gives a moisture-testing tool. Right underneath the chambers, there’s a rectangular receptacle which collects vermi-wash. This has two outlets fitted with valves. You need to open the valves to collect the nutritious liquid in a container. The receptacle is a closed container and hence, have no concerns about spillover or insects problems. The sprinkler: It runs on a 0.25hp motor. It needs to be turned on once in the morning and once in the evening for 15 minutes each. Appropriate moisture is crucial for vermicomposting. Earthworms breathe through their skin. Excess or inadequate moisture can pose threat to their productivity, at best; survival, at worst. The shredder: It is actually a pulveriser which pulps all the kitchen, garden, paper and cardboard waste. You can shred clippings of up to 20mm in thickness. It runs on a 3hp motor and pulverises 150kgs of waste in an hour. “Even a 500kg capacity system can depend on only one shredder,” says Anil. The staircase: The entire structure comes with a portable staircase fitted with industrial-strength wheels. The workers have to climb up the stairs to spread the pulverised waste in the containers. Interestingly, this is an independent, separable unit which can be moved to any of the four sides as the location demands. To start with, in each container, you will have to put 20-25 kgs of dry cowdung which is moistened just enough for the worms to reside in. You will do this only once in the beginning. Then add suggested quantity of earthworms supplied by the vendor. Right on top of it, put pulverised kitchen waste which has been mixed with garden cuttings, cardboard boxes and paper waste, egg shells, etc. And yes, you can even add non-veg waste but make sure that it constitutes not more than 20 per cent of the total waste to be composted. Fill the pulverised waste in buckets, climb up the stairs, open the hatches and spread the waste on the conical-shaped containers already filled with moistened dry cowdung and worms. The worms begin to work on the cow dung first and then move their way up to the pulverised waste. Do not try composting more than 50 kgs a day per container. Spread a moist gunny cloth on top of it for moisture retention. Lower down the hatches. Poking: When the process starts, it is essential to ensure proper air circulation all around. Although the mesh container is specifically designed to take care of this aspect, some bit of poking needs to be done through the mesh-holes once in a day so that the worms stay active and the vermicompost falls down into the trays placed at the bottom. For the first three months or so, you will have to put the vermicompost collected in the trays back into the containers. Earthworms love to live in a familiar atmosphere. Moreover, the microbial load in the vermicompost keeps mesophilic bacteria—which thrive at 20-45 deg. C—work on the substrate and help natural composting go on simultaneously. Only after three months will you start harvesting the compost. According to him, after three months of stabilisation, you can harvest “up to 7-8 kgs of compost” from a unit that processes 100 kgs of pulverised waste every day. The fantastic effect of nutrient-rich vermiwash on the plants is known to all. You can dilute this precious liquid or use directly for your plants, adds Anil. Composting goes on happening in stages, no matter which method we are talking about. At each stage, different set/s of micro-organisms break down the substrate and make way for the next. Even when we introduce earthworms manually, microbes keep riding their routine. As discussed already, only 5-10 per cent of non-veg waste can go in with garden and kitchen waste. “Be it veg or non-veg, our system uses African night crawlers for processing. They are best suited for this job,” adds Anil. The firm is ready to hand-hold its customers until they get a hang of the process and bring out a batch of compost. “At the time of commissioning, we will train a person employed by the customer to run the plant efficiently. After that, we will stay in touch on the phone if there are any issues, or else visit the site if required to sort out the problem,” says Anil. What is the approximate cost escalation with regard to sprinklers and shredders, especially for 500 & 1000 kg units? Anil: When we quote for any plant, it includes sprinklers and a shredder. A single shredder can handle up to 500 kgs of waste. When the capacity increases to more than 500kgs, say 600 to 1000kgs, then the second shredder will be required. The cost breakup for one shredder and the watering system is Rs 95,000. Will you ensure supply of earthworms in case something goes wrong and the customer is forced to restart the whole process? Anil: Yes, the supply of earthworms can be done and restarted at an extra cost. Does one have to do mandatory, periodical washing/cleaning of the system inside the shell? Anil: No, there is no cleaning or washing required inside the shell (suspended cages). Salary for 1 person; Rs 500 for power and water. Salary for 2 persons; Rs 1800 for power and water. Salary for 3 persons; Rs 3500 for power and water. Please note: Taxes,installation and commissioning charges extra. 50kg/day plant = 3hp motor working for 1hr = 2units/day. 100kg/day plant = 3hp motor working for 1hr = 2units/day. 500kg/day plant = 3hp motor working for 3hr = 6 -7 units/day. 1000kg/day plant = 6hp motor working for 6hr = 14 units/day. Akruthi Enviro Solutions Pvt Ltd, #10, 1st floor, Dasarahalli Main Road, Bhuvaneshwari Nagar, Hebbal, Bangalore-560024. T: (91) (80) 65703831, M(91) 9739897484, Email: sales@neoakruthi.com. This entry was posted in Community Composting, Endlessly Green. Bookmark the permalink. We are an apartment with 300 flats. We have installed an EarthCare composting machine and are composting our wet waste from January of this year. However, we dont know what to do with the compost generated. We do not have extensive lawns or gardens to utilize it. There is no space for us to dry the compost. Compost is now being piled up, with no takers. We are now paying truckers to take the loads away. Any pointers as to what to do with compost generated? We generate about 100 kg of compost a day.